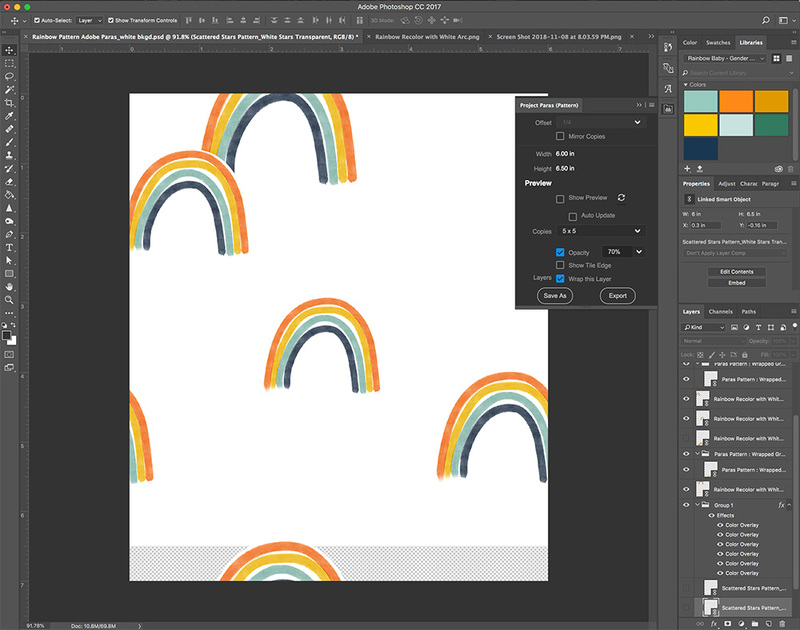 Raise your hand if you love working in Adobe® Photoshop® but creating a seamless repeat has you running far, far away. 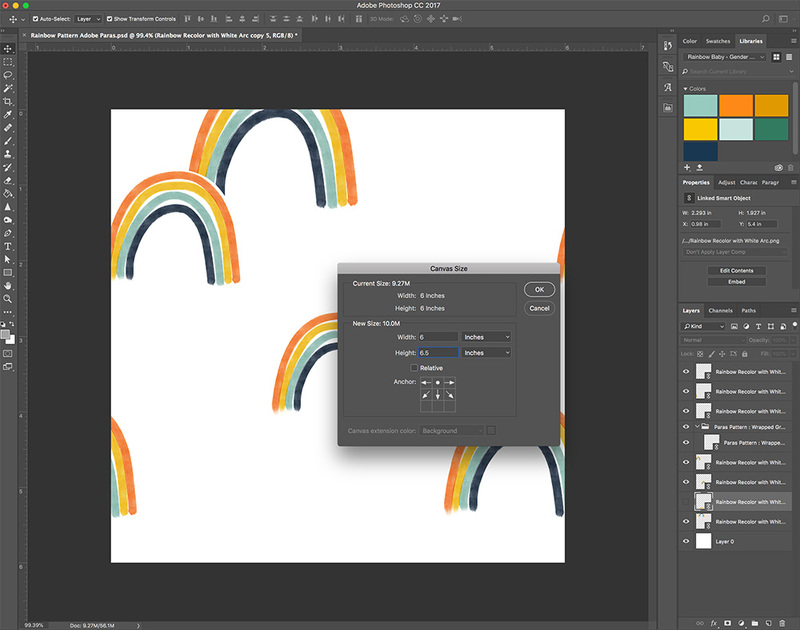 Our friends at Adobe know this feeling all too well, which is why they’ve created the newest tool to help you effortlessly create seamless repeats: Project Paras. Kalli Kunzler, the designer behind Spoonflower shop sweeterthanhoney, tested out this time-saving tool and she’s stopping by the blog to share her step-by-step tutorial. 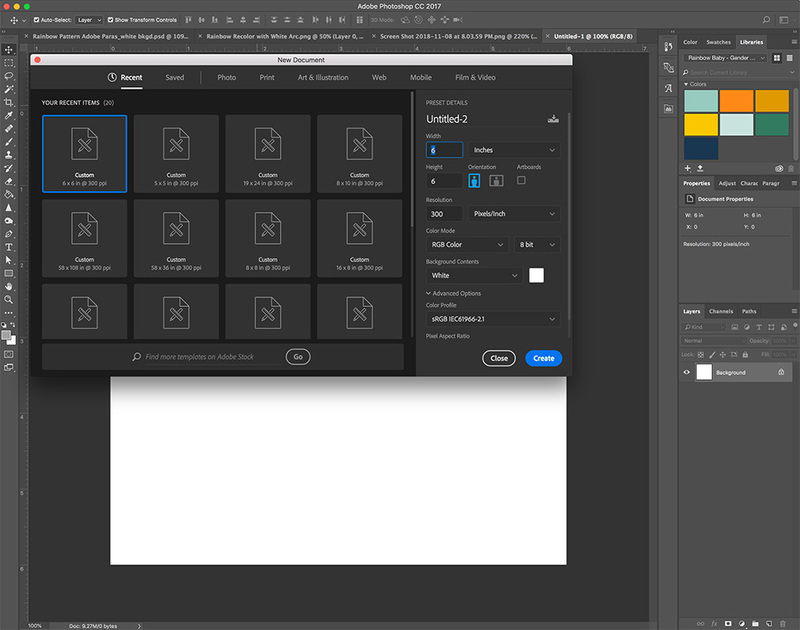 *Project Paras is a free extension for Adobe Photoshop. Download the free 7-day Photoshop trial here. Kalli: Yes! 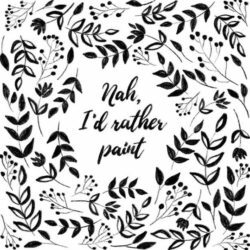 You’ve digitized some beautiful artwork that you’d like to make into a seamless repeating pattern but you’re not sure where to go next. 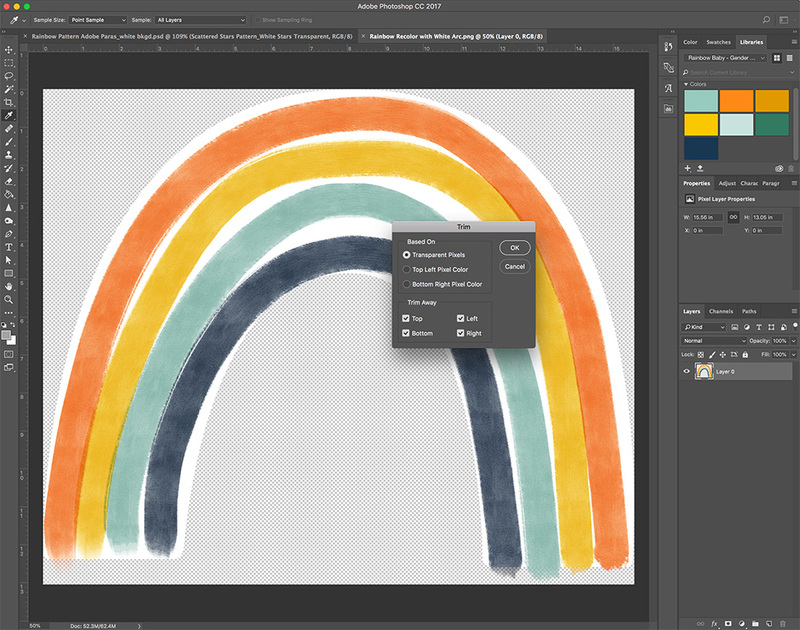 Adobe’s Project Paras plug-in simplifies and enhances that process, all within Photoshop. 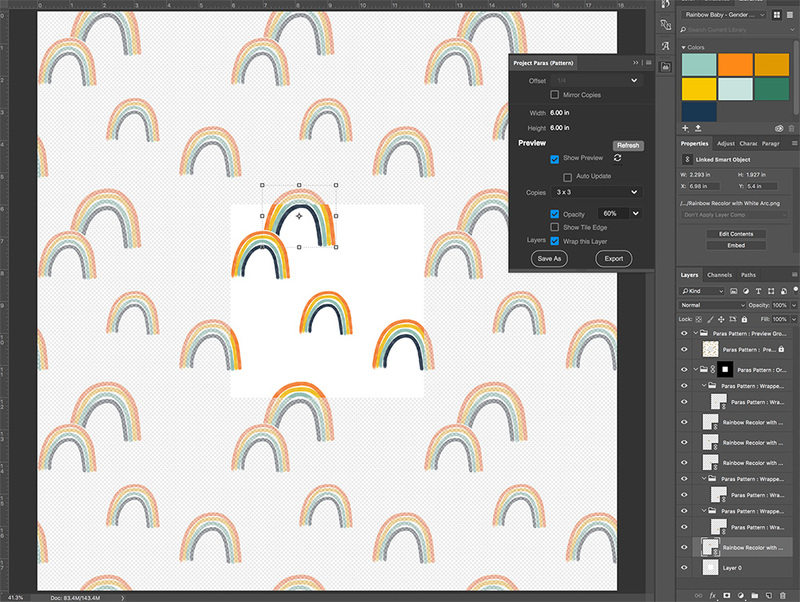 The tool’s Preview feature is a game-changer for seeing how your pattern will repeat. 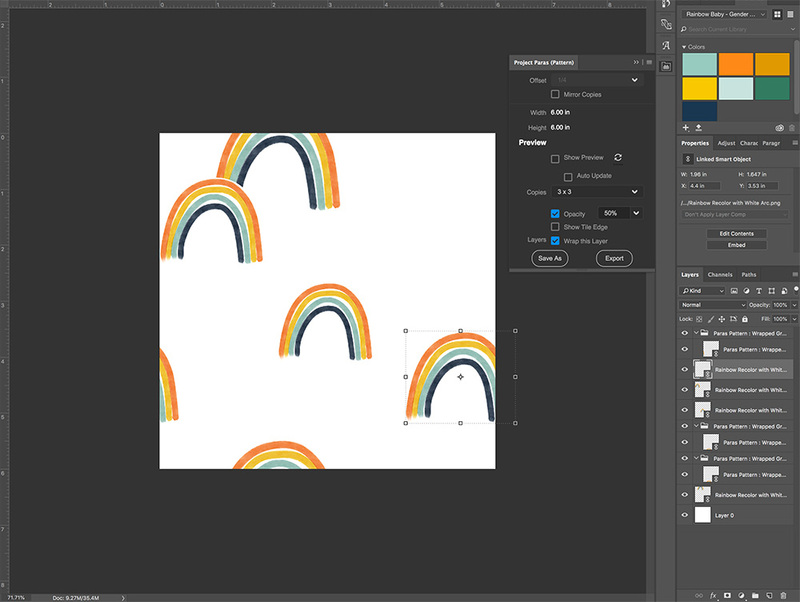 Paras makes it effortless to switch between repeat tile types (Spoonflower supports Basic, Half-Drop, Half-Brick, Center and Mirror) so you’ll have time to get crazy with it. 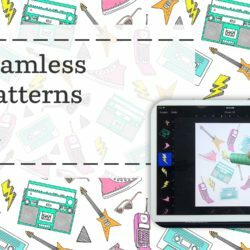 The details are outlined below, but it’s as simple as placing your art into Photoshop and then using Paras to preview your pattern repeat as you move and scale the elements to your liking. The Wrap this Layer feature even takes away the pains involved with elements that cross over the edge of your pattern. Before you get started, download the free Project Paras extension. 1. 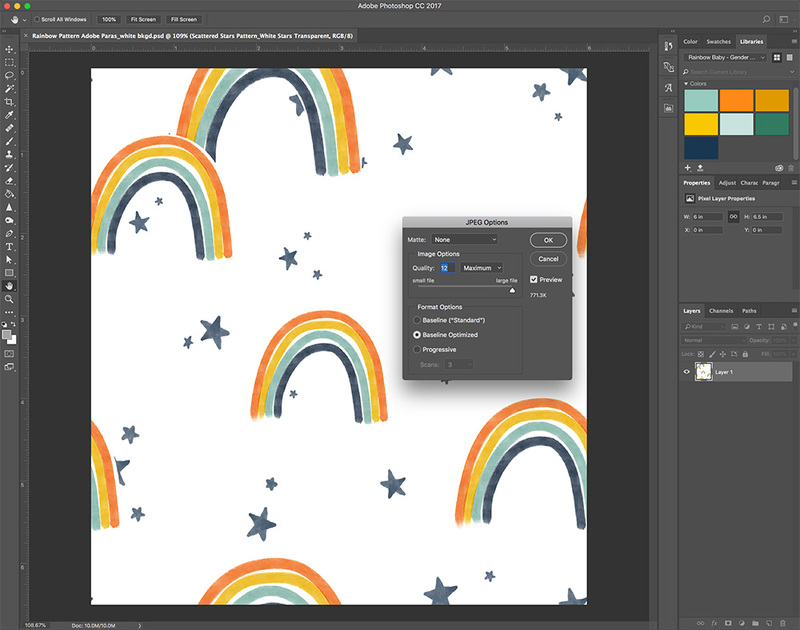 Save the artwork you want to use in your pattern as a PNG with a transparent background. 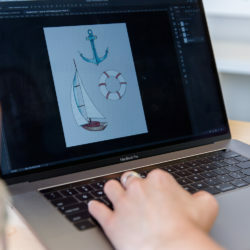 Trim off any excess by going to Image > Trim and trim away on the top, bottom, left and right based on Transparent Pixels. 2. Create a new canvas (File > New) based on the size you think you want your repeat (you can change this later). Pro Tip: I always create my files at 300 dpi and resize my final image later if I need a lower resolution. 3. 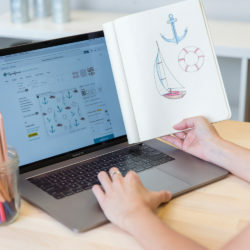 Place your artwork PNG onto your new canvas with File > Place Linked. 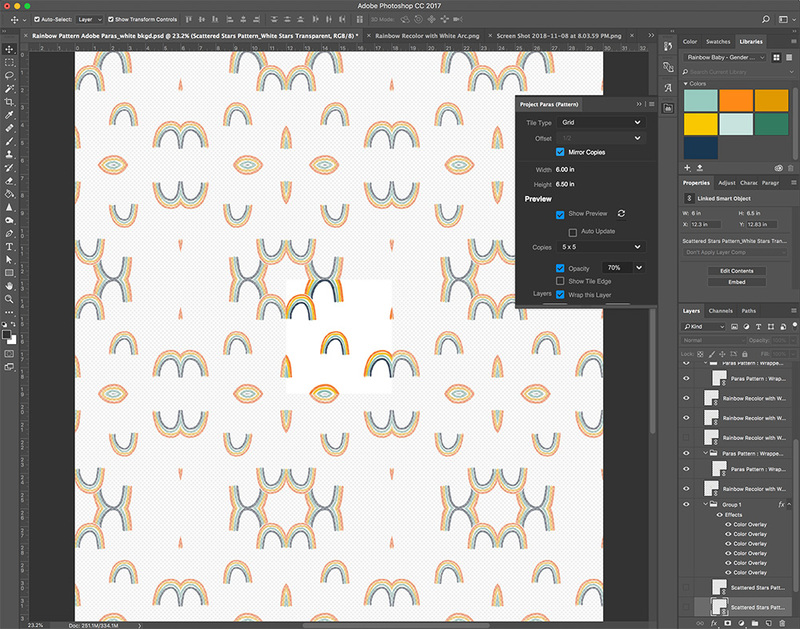 Pro Tip: Placing your artwork as a linked object and keeping it as a Smart Object will preserve your ability to make changes to the artwork even after you have duplicated, moved and scaled it throughout your pattern. 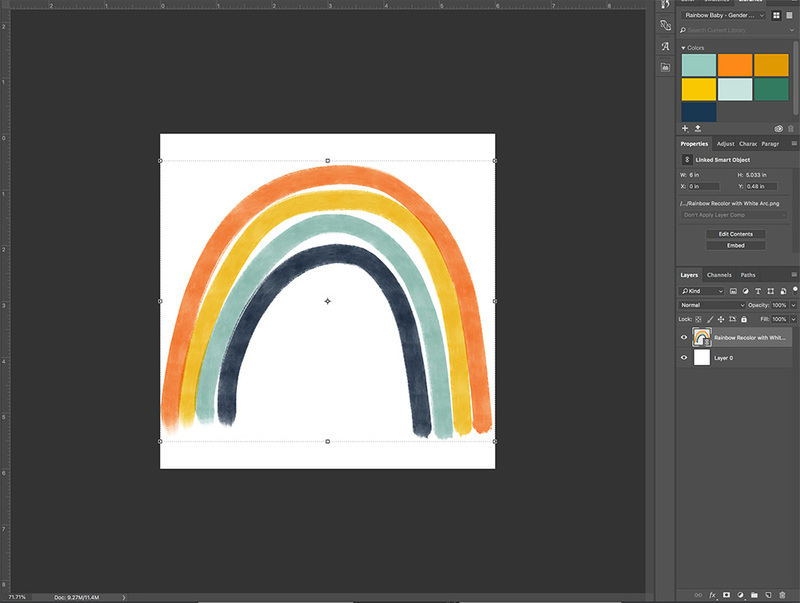 For example, after I had created my pattern I decided I wanted to slightly desaturate the navy blue arc in the rainbow. So, I opened my original Photoshop file containing the artwork, made my adjustment and then replaced the previous PNG with my updated PNG by saving it as the exact same name. 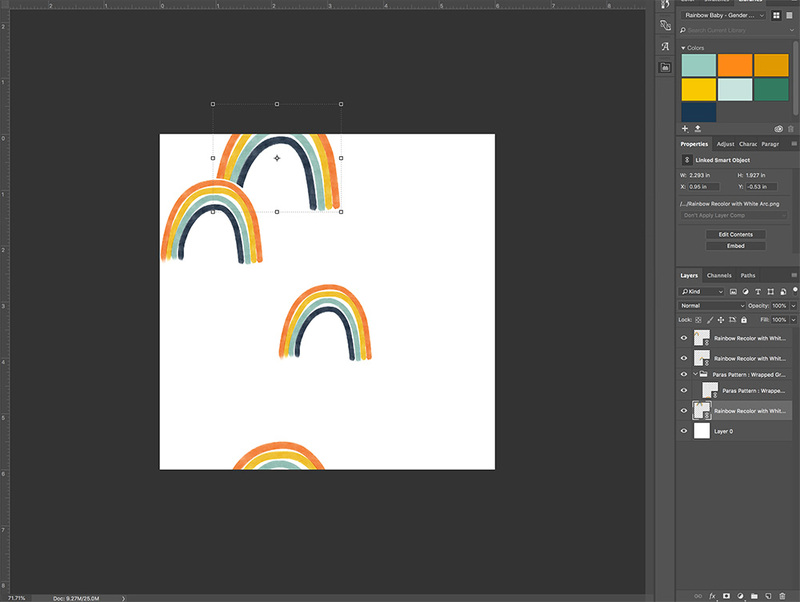 When I returned to my pattern file, the Smart Objects automatically updated to the new rainbow without moving a pixel. 4. Play! Play around with the placement of your element. Duplicate it (Layer > Duplicate Layer), transform it larger and smaller (Edit > Transform > Scale), layer elements to give depth… go wild and follow your own style! This feels like the right time to remind you to SAVE OFTEN! 5. Open Project Paras (Pattern) by going to Window > Extensions > Project Paras (Pattern). 6. If you have an element that crosses the edge of your canvas, select the layer and then check the Wrap this Layer checkbox in the Project Paras panel. 7. Now for the part that makes you do a happy dance… Check out your repeat by simply checking the Show Preview checkbox in the Project Paras panel. Copies allows you to choose how many times you’d like to see your pattern repeated vertically and horizontally. Opacity controls the transparency of the repeated tiles, which makes it easy to identify the original pattern. Show Tile Edge, not surprisingly, outlines the edge of your pattern tile. If checked, Auto Update will automatically update the repeated tiles when you make any adjustments to your pattern. I found that my computer worked quicker when I left that unchecked. 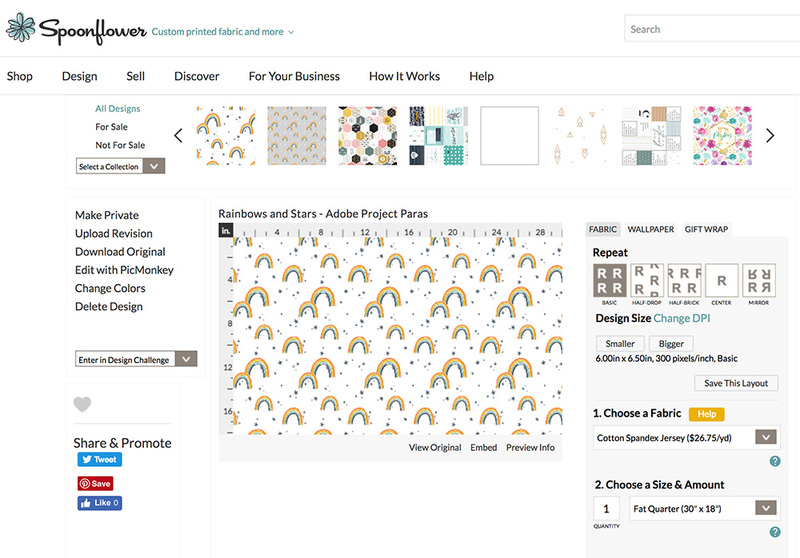 When you make adjustments to your pattern, click the refresh icon button next to Show Preview and the repeated tiles will update. If your computer is going too slow during this process, uncheck the Show Preview button while you make your adjustments. Testing out the mirror repeat! Continue to move your elements around until you are proud of the way your pattern looks repeated. Again, I implore you to save your file! I decided to keep changing my pattern a little. I unchecked Show Preview and worked in my normal Photoshop space for a minute. I wanted a more vertical space between my elements, so I lengthened my pattern tile by going to Image > Canvas Size and adding half an inch, anchoring the canvas at the top center. 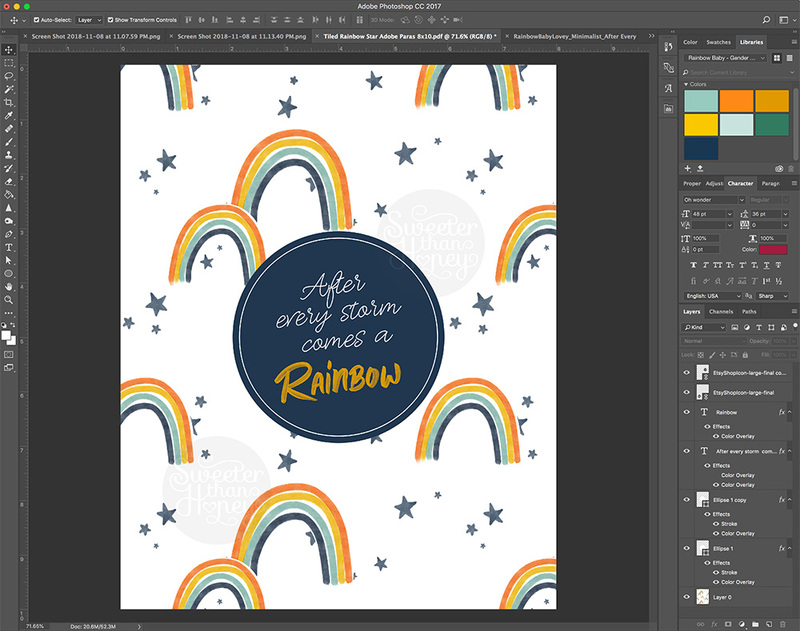 A beautiful thing happened because I am using Paras: the rainbow element which is placed along that bottom edge automatically moved to be in the correct place because I’d previously selected Wrap this Layer in the Paras panel. I transformed my background layer to fit the new canvas size and applied a gray Color Overlay (Layer > Layer Style > Color Overlay). I wanted more of a magical feel to this pattern so I added stars. 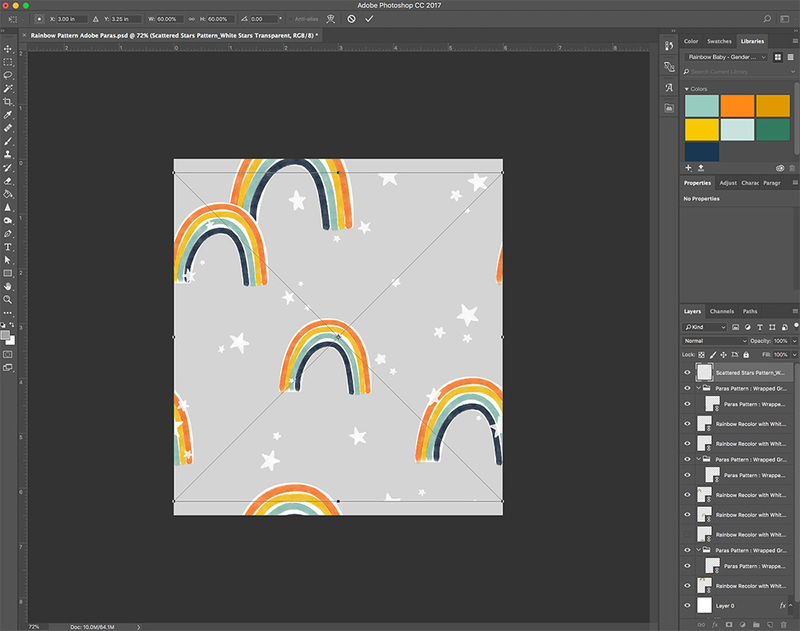 I already have a repeating pattern of scattered stars from a few months ago so I placed them as a PNG (with transparent background) onto my canvas, then transformed it to fit my pattern tile entirely. The color combination wasn’t making me drool, so I changed it with more Cover Overlays. I also decided to move the star pattern around to show them better from behind a couple of rainbows. This meant that I now had another element crossing over my pattern edge. Thankfully, that was an easy issue to deal with because I simply checked Wrap this Layer in Project Paras while the star layer was selected. I turned on the pattern Preview in the Paras panel one last time and fell in love with how my new pattern looked as a repeating pattern. 9. Saving your pattern tile is a cinch. While you still have your Project Paras panel open, select Save As at the bottom. I usually save my files as a JPG for uploading to Spoonflower. Keep your image quality as high as possible for saving your original file. If you need to reduce the size later, you can do so with a copy of the design. I like to select the Baseline Optimized format option because it keeps colors accurate and creates a slightly smaller file size. 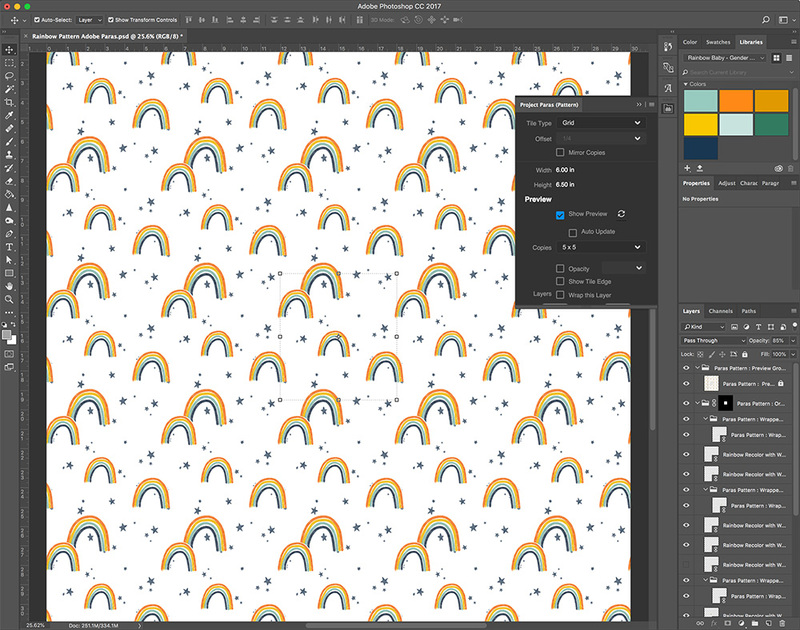 The Export option will fill a rectangle with your repeating pattern. You specify the Units, Width and Height then select Create. You will specify where to save the file and it will automatically save as a PDF. I like using this feature to fill the background of other fun designs like blankets and wall art. 10. 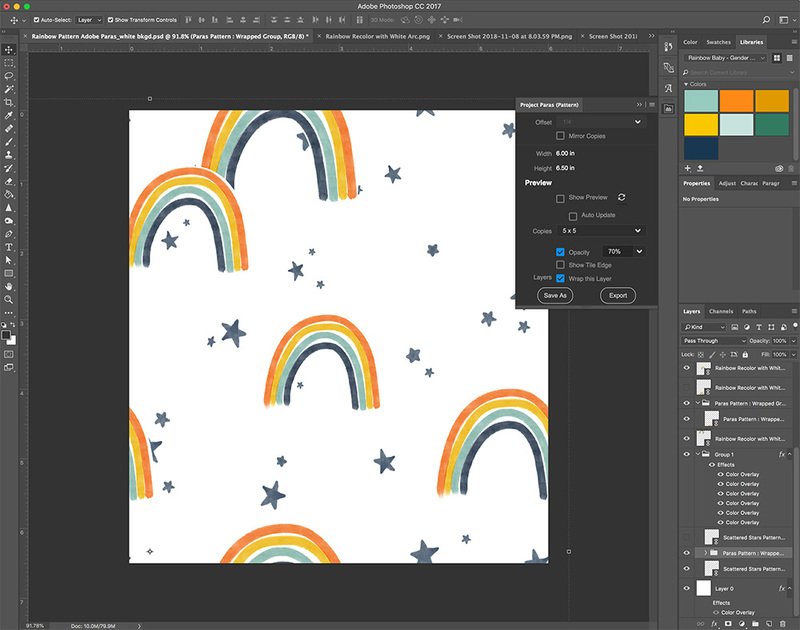 When you upload your new spiffy pattern to Spoonflower, be sure to select the correct Repeat type and select Change DPI to update it to 300 (or whatever you saved your file as). Choose a fabric you think it would look marvelous on – my examples are on Celosia Velvet and Silky Faille – and select the Size of fabric you’d like your customers to see as the default preview. Select Save This Layout. Fill out the rest of the marketing information for your design and order yourself a swatch! Or a yard! 11. Wait impatiently for the mail to come and jump for joy when you get to hold your new fabric that you designed with Adobe’s Project Paras. 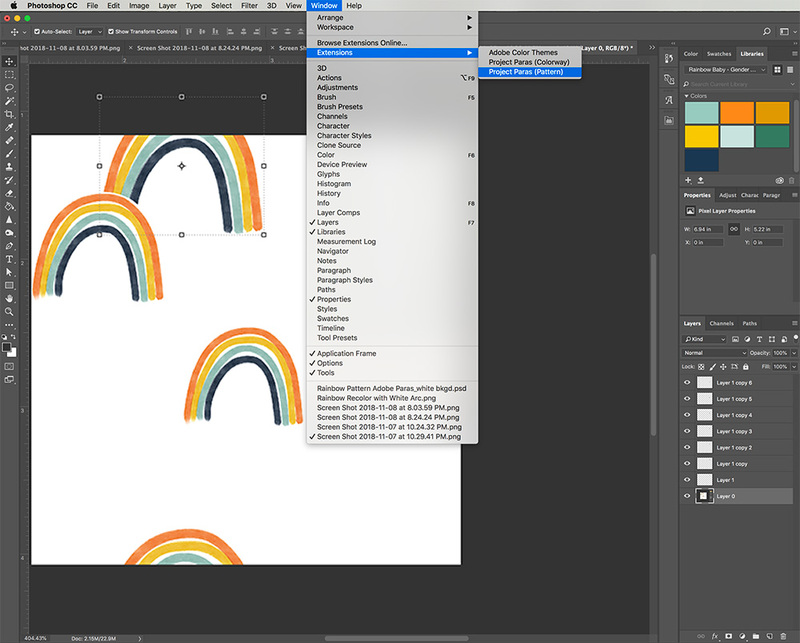 For even more seamless repeat tutorials, don’t miss these design resources. Shop more of Kalli’s rainbow designs! 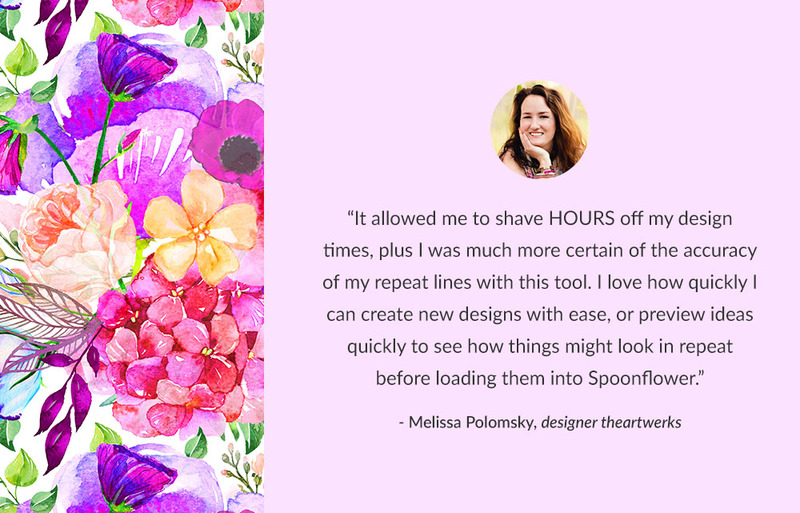 Businesswoman-turned-graphic-designer, Kalli Kunzler (SweeterThanHoney) fell in love with designing meaningful fabric when she discovered Spoonflower a few years ago. 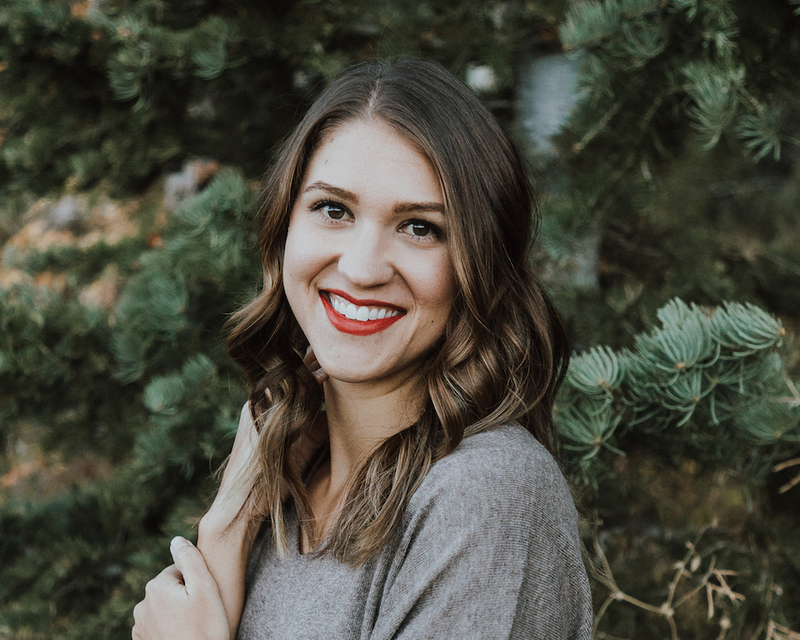 By day she treasures being a full-time mom of three young kids and is excited to have the whole family skiing together this season in Northern Utah. 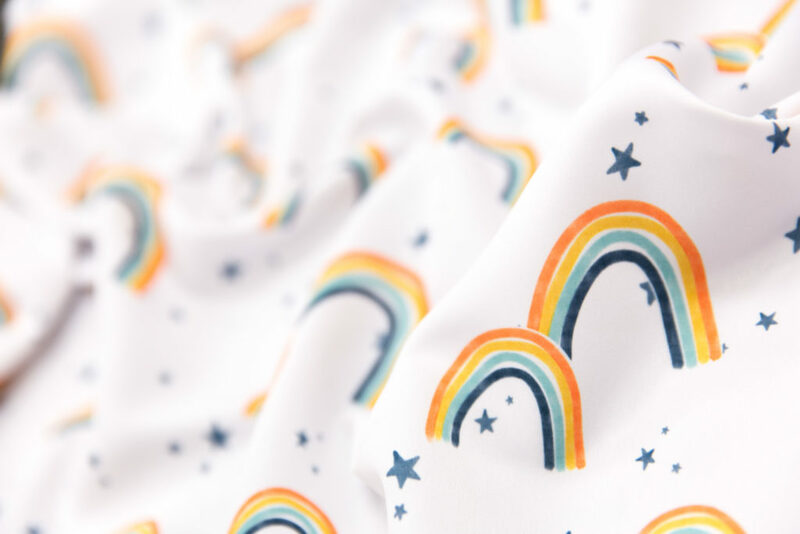 By night she dreams up new surface patterns for special people and occasions; the latest of which you can find in her new exclusive, custom minky blanket shop: The Warm Fuzzies Co.
this is a major development in making designing easier for everyone. 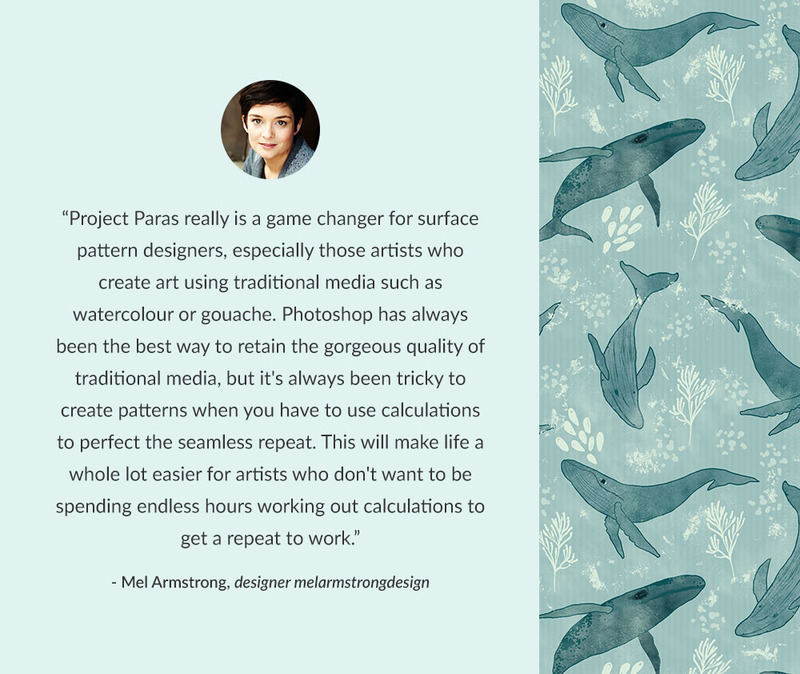 I will definitely be teaching Project Paras to my students so they can make better seamless designs. 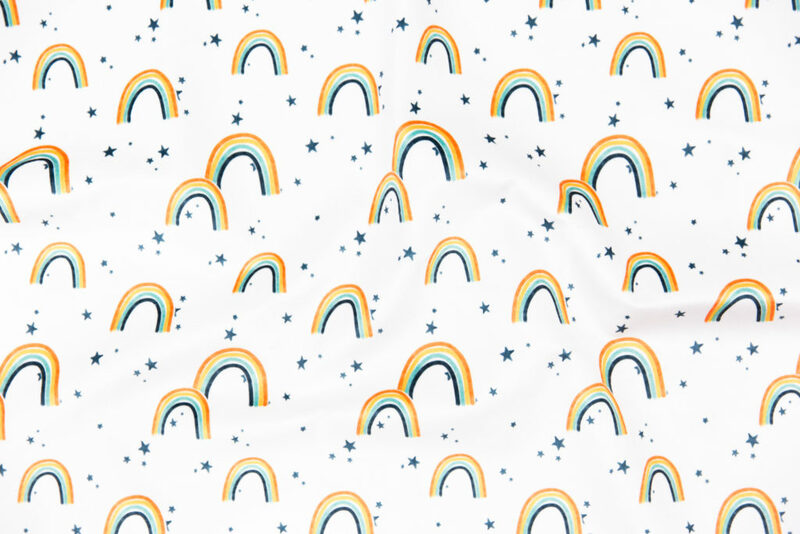 Then when they upload their designs to Spoonflower, their fabrics will look amazing! OMG!!! This is the tool I’ve been waiting for!!! You guys are awesome. Made my day/week/year!! I’m so excited to try it out right this minute! !